Why Is Part of Facebook Broken? In 2008, Facebook rolled out a feature that's so taken for granted, you probably don't notice you're looking at it half the time. But today, when you do check out the People You May Know section, it stands out. What's with all the weird strangers? The idea is simple: in order for Facebook to grow stronger, it needs you to be constantly growing too. Odds are, you friended most of the people you actually know and care about years ago, and barring a job change or a new girlfriend, your online friend sphere rarely sees large spikes. So Facebook gives you some artificial stimulation in the form of Friend Suggestions, an odd social idiom that we don't really question in these odd social times. "You'll see People You May Know on the Find Friends page and even as News Feed stories," explains Facebook. "The Home page box will only appear with what People You May Know considers to be its very best suggestions." The very best. So then why are we suggested friendships with absolute strangers, with whom we have absolutely nothing in common? Sometimes you'll see people with whom you have 70 or so mutual friends—someone you truly may know, without any stretch of the imagination. 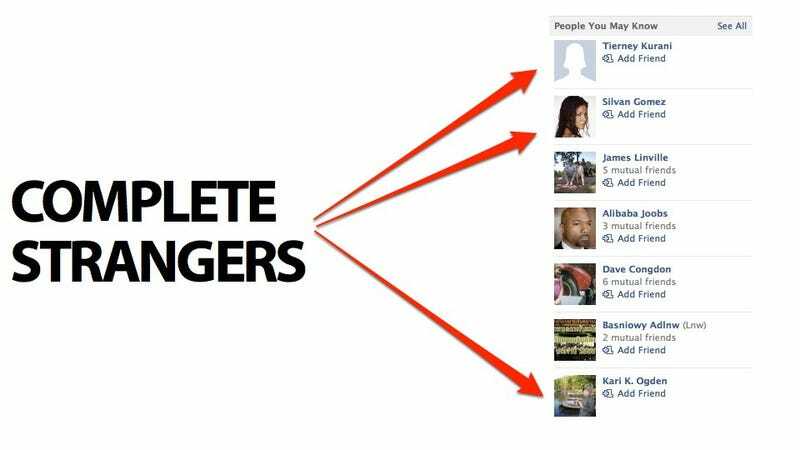 But then, with what anecdotally seems like increasing frequency, there are plenty of people in the list who you have zero mutual friends with. People you didn't go to high school or college with. People you've never shared an office with. People who live on the other side of the planet. People you not only don't know, but will very likely never know. Facebook admits that because the "formula is automatic, you might occasionally see people you don't know or don't want to be friends with." But didn't they just say these are only "the very best"? Why am I being shown strangers—and presumably, why are strangers being shown me? This isn't any kind of privacy crisis or design blowup—just a bizarre part of Facebook that makes zero sense. You can delete each faulty suggestion, and it'll never return. But it'll certainly be replaced, and as you run out of real people to make contact with, the odds seem ever-greater that the slot will be filled by a total and complete stranger. So why suggest anyone at all? Facebook hasn't given us any explanation beyond a link to what's linked above.